Happy Monday and Happy Thanksgiving week! I hope everyone had a pretty amazing weekend. This week is going to be pretty busy for us. just like most families. Thanksgiving is one of my favorite holidays. I love being able to see spend time with my family and friends. This year we're not hosting Thanksgiving dinner. We were hoping that my sister was going to host this year. However, she managed to have her in-laws host instead. I plan on creating a small dinner for my family. It will most likely not be a whole turkey. However, I do plan on roasting a turkey and making some of our favorite sides. Great planning ! I love the Friday Pizza + wings . Happy TG! Love your meal planning tips and that you include the man in the mix. Alfredo sounds amazing this week! That's a great menu, while we don't celebrate Thanksgiving, to me every day should e thanksgiving for all what we have. But still, I have got some gifts for my friends and family, to personally thank them for their presence in my life. What a delicious sounding menu! I'm especially excited for the Thanksgiving meal! Great meal plan! Who doesnt love a good garlic bread! It goes with everything! Happy thanks giving! We are headed to my in laws for Thanksgiving, so as we travel, there will be no cooking for this Momma (woo-hoo!) Your menu looks delicious - Love the Pizza option so you can stay on the go on Black Friday. Yes! 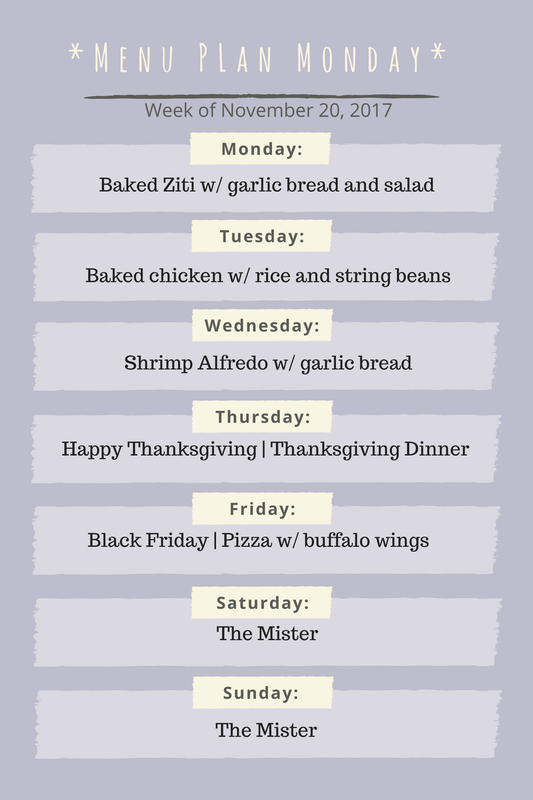 Another great week menu meal plan, I am going to try the make baked ziti. Thanks for the consistent inspiration! I've really been trying to get on top of meal planning now that I'm out of my parent's home. I've been struggling a little lately because I hate to eat the same thing twice in a month (I know, I sound so picky haha) so any bit of inspiration helps. :) It sounds like a good week of food for you and your family hehe. We just had a relaxing thanksgiving at home. Made a ton of food and just hung out at home. Pizza with buffalo wings sounds so good right now!